Electricity: Generator for the school building, in operation approximately two hours daily. Additional generators that operated in the past were confiscated. The Wadi Abu Hindi residential area is located southeast of Ma’ale Adumim, near the northern side of the settlement of Qedar. The residents originally lived in the area of Tel Arad and Beersheba, but were evacuated in 1948 to the Hebron area, and in the 1950s, reached their present location and received permission to settle there on lands owned by residents of Abu Dis. In the past, when their livestock holdings were greater, they were semi-nomadic, and would migrate to seasonal grazing areas for a period of two to three months per year, and then return to their permanent place in Wadi Abu Hindi. Long ago, however, they abandoned this practice due to impositions on their freedom of movement in the area, and the closing off of grazing areas; today grazing takes place year-round in the immediate vicinity of their living area. Most of the community’s living area is located on private lands belonging to the village of Abu Dis, while some is on declared state lands; none of it is included in any of the Israeli settlement plans. 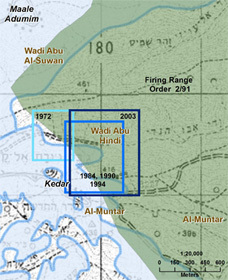 The community is spread across the channels of the wadi, and it appears that in the past, all of its living areas fell within the boundaries of private lands. Over the years, however, after the community had already been living there, some of these lands were declared as state lands, entirely ignoring the presence of residents and their agreements with the original landowners. 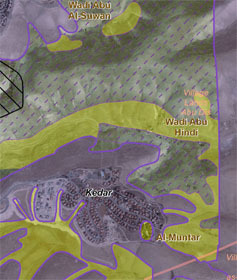 In the past, there had been a number of centers of Bedouin residential clusters in the area where the Qedar settlement was subsequently established. 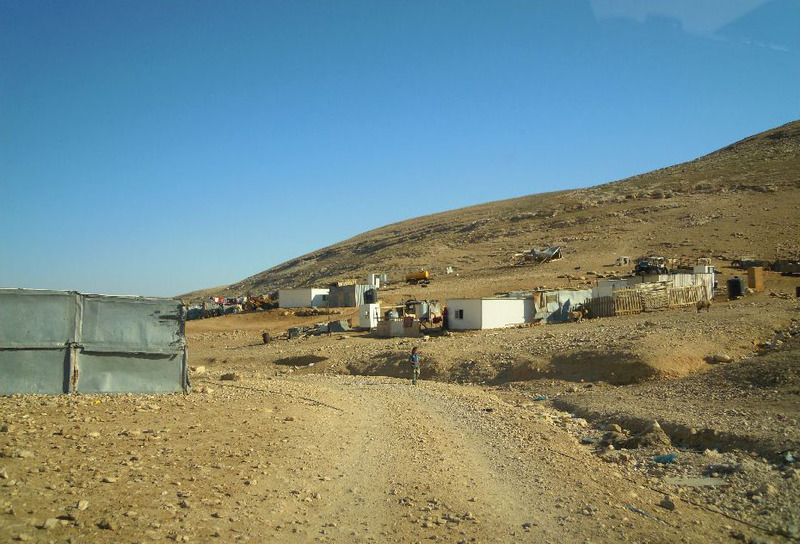 As in other cases, the establishment of the settlement and its expansion over the years pushed the Bedouin residents outside of the zoned settlement area. As a result, today all of the Bedouin live in the wadis and on hills surrounding the settlement. This entire area was declared a closed military zone in an order issued at the beginning of the 1980s and renewed last in 2007, even though, in most cases, no signs have been posed on site to indicate this status. And yet, most residents are intimately familiar with the area, and know that most of it is off limits. This, of course, has a decisive influence on movement and grazing options, and on the very possibility of continued dwelling there. In 1997, demolition orders were issued for buildings in the community, and indeed, according to residents’ testimonies, during this year, the entire locality was demolished, water tanks were confiscated, and flocks were impounded. The residents were left in a very dire state, without homes and water, for two weeks. Later, the locality was rebuilt, but in 2010 orders to halt construction were issued for five houses, and subsequently, in 2011, demolition orders were again issued for all of the buildings there, including old buildings that were undergoing repair and maintenance work. It appears that renewal of the demolition threat is in order to accommodate the course of the planned separation barrier that will pass through the community; this is confirmed by the seizure order issued for purposes of its construction. The school structure in the community has already been destroyed and rebuilt three times, and today, again, a demolition order has been issued against it. Declaration of the entire area as a closed military zone limits grazing options. The possibility of roaming with the flocks was limited and has been further restricted, and occasionally, the army confiscates the flocks on the pretext of grazing in a closed military zone, and transports them to the area of Fasayil near Jericho, forcing residents to redeem them for 100 shekels per head and return them home at their own expense. There areno preschools, but there is an elementary school for grades 1-9, attended by some 140 students from the area, which operates in a structure also constructed from wooden boards and tin. For high school, the children commute to As-Sawahra via private transport vehicles funded by the parents, without any help from the authorities. 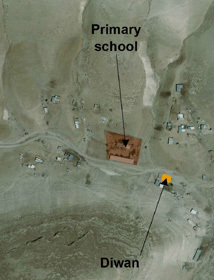 The school is powered by a generator that is insufficient, and operates only two hours per day. In the winter, when the roads are impassable, the teachers cannot reach the school, adversely affecting studies. Similarly, high school students often fail to arrive at the school in As-Sawahra due to weather conditions, the irregularity of the roads, and the necessity of having to traverse a section that passes beneath the road and is flooded in the winter by rainwater. Moreover, on winter days when the students do arrive at school, they return home when it is already dark, on an unlit route, to homes without electricity precluding the possibility of doing homework, negatively impacting their studies to an even greater extent. In the past, residents of Wadi Abu Hindi worked more in agriculture, raising wheat for flour and barley. Today, however, there is very little agriculture, and they barely succeed in tending small gardens for home consumption. The greater part of their livelihood comes from raising flocks, which graze year round in the nearby surroundings. Those who raise livestock encounter many problems due to the significant reduction in the grazing areas, the tremendous rise in feed prices, and the great difficulty in obtaining veterinary care. The unemployment rates are very high. Some 80-90% of the residents have no income. The women bring in no income whatsoever, and fewer than ten of the residents are employed outside of the community. Residents suffer from the environmental hazards of the garbage dump located nearby. The dumpsite emits offensive odors, mainly at night, and the local leaching pool, located close to their access road, contains liquids that pose a health hazard. In the opinion of the residents, the site is endangering their health and more severe effects will be revealed in the future; already today asthma is very prevalent in the local community, particularly the younger generation.